I've been hooked on madeleines since the first time I tried them. So simple, light and extremely versatile. Don't be tempted to leave out the resting stage as this along with the hot oven gives you the wonderful bump. You will also need a madeleine pan, greased with cake release spray, plus a piping bag. You can find the pans in most good homeware stores now or online. In another bowl, or free-standing machine, whisk together the eggs, sugar and zests until pale and frothy. Add the sieved dry ingredients and whisk until just combined. Stir in the melted butter, cover with clingfilm and chill for at least 60 minutes. Pour the batter into a piping bag and pipe the moulds two-thirds full. 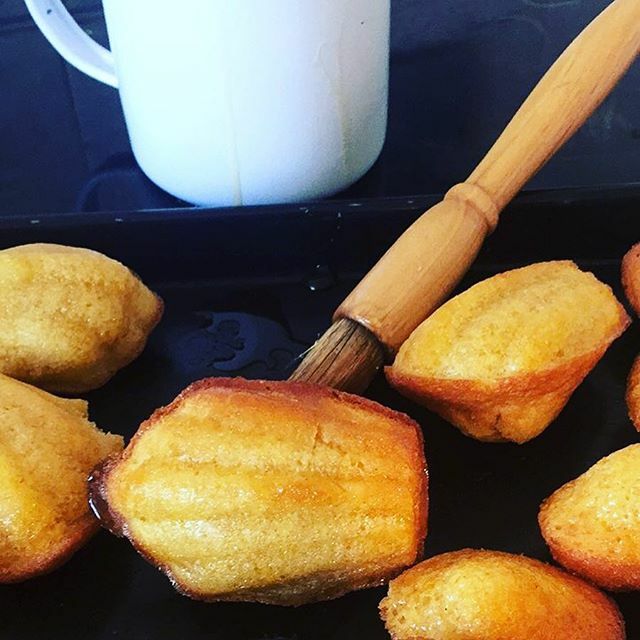 Bake for 5 minutes, reduce the heat of the oven to 180ºC/350ºF/gas mark 4, and rotate the madeleines. Bake for a further 5 minutes until the centres of the cakes rise and the edges are golden brown. Heat the juices together with a splash of water, vanilla pod and the caster sugar until the liquid becomes syrupy. Remove the madeleines from the oven brush with the citrus glaze while still warm.